In the autumn of 2012 Muse released their sixth studio long playing record, The 2nd Law, that, long before it was out, was named one of, or simply the one main even on the British rock music scene. It is true, the band has earned a status that allows people to speak of top quality and originality of the fresh product even before actually listening to it. Regarding this, the new album is no exception. By describing the upcoming record. Having named about a dozen styles, from gangsta rap to jazz and psychedelic rock, he must have confused Muse followers who know how unpredictable Muse can be/ But that is the way English humor is, although not everyone understands or accepts it. The 2nd Law has quite distinguished stylistic boundaries, albeit the tracks, like the tracks of any other Muse album, can hardly form something whole and integral. But this is exactly the case when this diversity only makes the performer better. Matt Bellamy’s promises to bring their music one day to the orbit and play it in space no longer seem void words of bragging. Muse are expanding, growing and covering ever more areas. The 2nd Law sound as epic, vast, high and deep as never before. Hence the CD is opened by the hymnal Supremacy with orchestral backdrop and spy movies themes all over. How can you not recall the fact that Muse have always been Queen fans? Yet, Madness is definitely an effort to please not Martians, but Earth inhabiting listeners, and not just a few, but all over the world. Muse afforded recording a real pop hit with a mighty chorus, sunshine bright and clear sounding and striking impact. What appears more interesting in terms of music is Panic Station, manufactured again from Queen borrowings and, this is a real surprise, retro disco rhythms. Well, we approach the middle of the album and still we do not feel the genuine classic intelligent Music rock. Follow Me is the first, and far from the last, experiment with thick dubstep layers. Then come two rather different tracks with bassist Chris on vocals, Save Me, and Liquid State, about his struggle against alcohol. As unexpected and curious as it sounds, Chris had better remain on back vocals. The album is closed by 2nd Law: Unsustainable, and The 2nd Law: Isolated System, and again dubstep is dominant here. Now it becomes totally clear that Muse, who have claimed repeatedly intentions to play a different music, have finally done it. The CD has no touching piano, nor rough guitar riffs or burning passions. The 2nd Law is a very roundup, lively enough album, which makes it a good source for concert sets, but it is far less edgy and nervous than the other Muse efforts. And fans of this amazing band will have a tough choice to make: whether to get accustomed to this transfiguration, embrace it and love their new music just as they did the old; or to miss the past and keep playing first records over and over. The thing is that this kind of electronic and smooth, easily digestible Muse is endlessly fine and trendy, but what is it left to do with what the ensemble used to do? 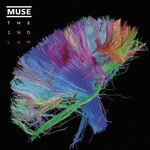 So, to evaluate the scale and consistency of The 2nd Law, you might first need to forget that this is a Muse album.